Loose Powder Mineral Foundation - Mineral based makeup that's actually good for your skin! Many of our loose powder mineral foundations protects your skin from broad spectrum UVA and UVB rays (SPF20). Does not contain any Talc, alcohol or mineral oil. Very water resistant. Non-comedogenic. Not tested on animals. Vitamins and aroma therapy added. Great for all skin types. A foundation best suited for light ivory to fair skin Directions on how to use loose powder found..
A foundation best suited for cream/beige skin Directions on how to use loose powder foundations: ..
A foundation best suited for cream/beige skin Directions on how to use loose powder mineral found..
Slightly darker than Cool Beige and Canvas Foundation; is best suited for medium tanned skin. Dir..
Slightly darker than Barely There Foundation so best suited for light ivory to fair skin. Directi..
A foundation best suited for olive/yellow skin Directions on how to use loose powder foundations:.. This loose powder mineral foundation is designed for an African American skin done or darker, and is.. 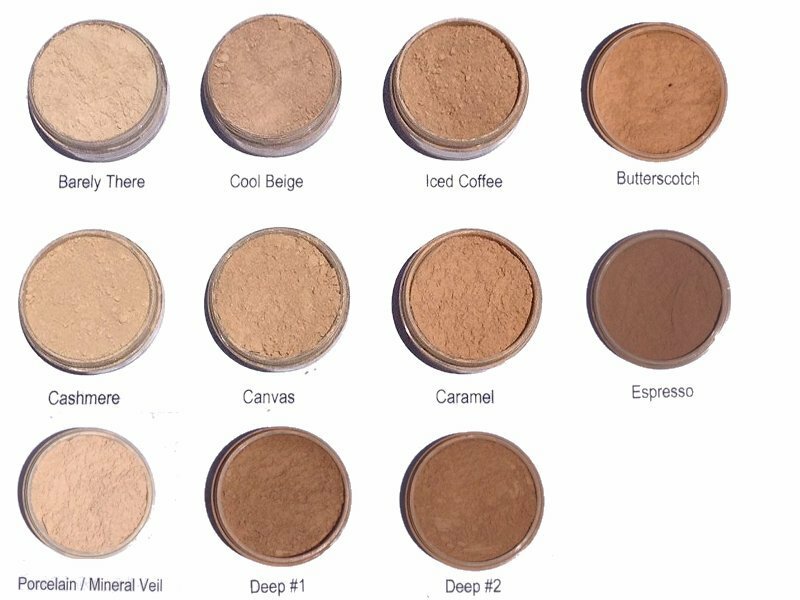 This loose powder mineral foundation is designed for an African American skin tone and is darker tha.. The main ingredient in our porcelain finishing powder is micronized oat powder, which is a colorless.. Mineral Mist - Setting Spritz is used to set mineral powders after they have been applied. This..